here is china glaze's beautiful stella from the retro diva collection 2009. she is a gorgeous glowey dark purpley shade. its a sort of metallic violet-magenta. very shimmery and alluring. i've had this in my pile of "untrieds" for a while (from my package from reader amy, thanks again girl!) and i cannot believe that i haven't worn this yet! i have to admit, it looked like any other purple shimmer in the bottle, but once i had it on, i was just mesmerized by it's depth and dimension. it is totally one of my favorites now, it has that amazing ember-glow-from-within feel that i adore. very easy to apply too. this is 2 coats. i had at least three girls in my college classes compliment me on my polish--i've never even talked them before! and if it's possible, i love it even more when i matte-ified it. 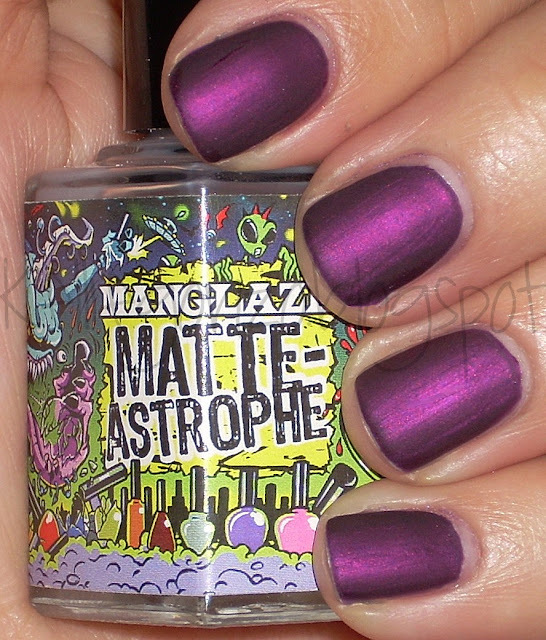 i used man glaze's matte-astrophe matte topcoat (which i was sent and will review in another blog post). the matte texture makes stella look like VELVET! awesome. loved it. i think this is just about the perfect length for my nails. i've had them a lot longer (obviously if you read my blog you've seen) and super short. but this length is very comfortable, for painting and for my lifestyle. i think long nails on me look weird, although i love them on others. what is your perfect length? and shape? i've finally decided that mostly square with slightly rounded edges is the way to go for me, just the way my hands are shaped, it's the most flattering i think. plus it cuts down on snags and broken corners.